Decent-quality car floor mats can help to maintain the interior of our cars, protecting them against grime, dirt and debris. Certain substances and chemicals can even corrode and irreversibly damage car interiors. Thus, it makes complete sense to protect the floor of any vehicle with a car mat, so that these substances and dirt cannot transfer directly onto the car’s interior fabrics. 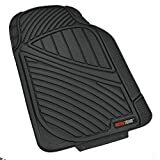 This 4-piece set of car mats from Motor Trend isn't the cheapest, coming in as the most expensive of those we've looked at. They're all-weather, heavy-duty mats that are suited for extremely wet, tough conditions, and feature a trunk mat to guard the carpet in the rear of your vehicle. This makes them perfect for those who regularly take part in outdoor activities that require equipment that is constantly exposed to the elements. 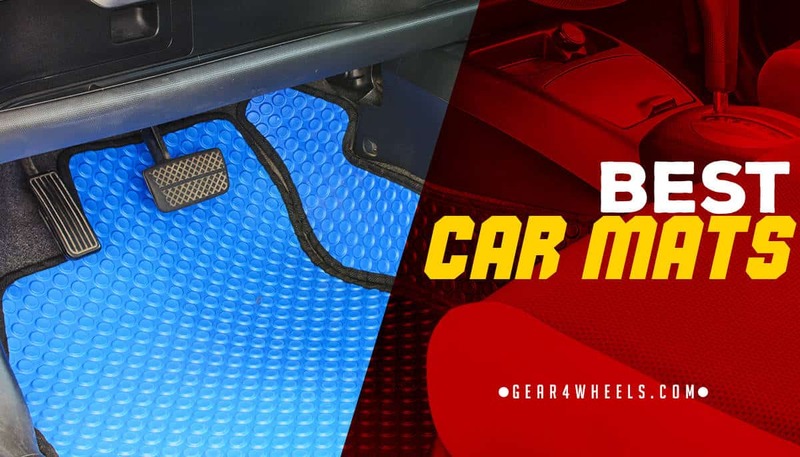 Unlike some car mat sets, this Motor Trend product includes a cargo liner, protection for the trunk of your vehicle that allows you to carry wet or dirty equipment without fear of damaging your trunk's carpeting. 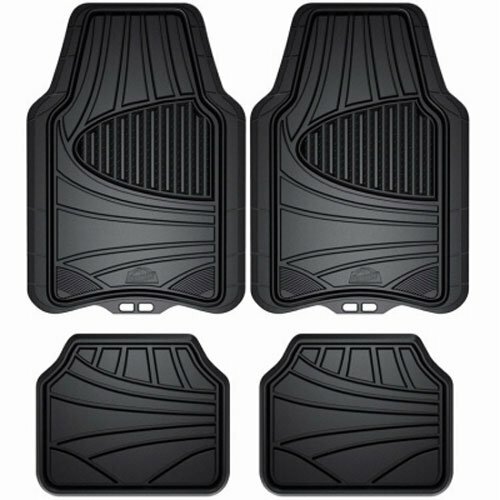 The rubber used is 100% odorless and non-toxic, removing one of the most common complaints surrounding rubber car mats. When it comes to fitting the mats into your vehicle, the act of trimming them down is easy thanks to thick and malleable rubber that won’t tear in undesirable places. The girth of the rubber is also helpful in preventing slippage underfoot when the mat is laid in your car. Aside from these obvious benefits, it’s worth noting that the increased price tag is clearly reflected in the quality of this product; its heavy-duty design is truly beneficial when it comes to surviving in constantly wet and dirty conditions. Though it’s a relatively minor complaint to have, you’ll have to trim these mats down a lot to fit your vehicle. The rear piece is also a single piece, meaning you’ll need to have a vehicle without any middle runner preventing the mat from being laid. The rear mat also has a considerable size difference to the front and may not offer full corner to corner protection. Finally, although the rubber is heavy-duty, it is also quite soft, meaning that it could flatten over time and lose some of the grooved definition. 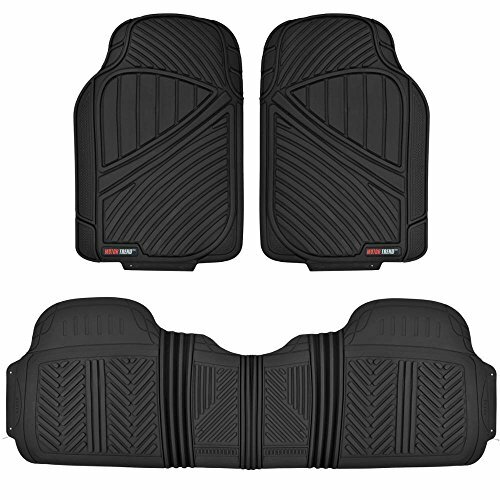 The OxGord Universal Fit Rubber Floor Mat comes in a set of 3 pieces, with 2 trimmable front-seat mats, plus a rear runner to cover the full width of the back seats. Price-wise, these mats are roughly average and can be picked up in a range of 4 distinct colors. Measurements: Front 17.7 x 28.35 / Rear 60 x 17 in. These OxGord floor mats can be purchased in one of 4 distinct color designs and feature heavily durable rubber that won't tear or rip under the stress of heavy-duty footwear. What’s more, the specific dimensions used have been modelled on the most commonly seen vehicles on the road, to increase the chance of them being compatible with your car, SUV or truck. Regardless, they can easily be trimmed down to size should the need arise. A heavily grooved design helps these heavy-duty mats to trap lots of dirt and debris, so it can easily be shaken out after each journey. The highly resistant design also makes them easy to hose off and clean without causing any water damage. Comparing price tag against quality and the materials used, this product offers fair value for money, and we also like the customization options that allow you to match both the interior and exterior of your car. These mats do participate with the common complaint of a chemical odor when first removed from their packaging, though this does subside after a period of several days; thus, it’s worth removing them and allowing them to air out before placing them into your vehicle. Another common complaint amongst single-piece rear mats is that they have a worse fit than those in the front. Otherwise, the only other complaint is a lack of any grips on the underside to help prevent slippage, but they do at least have grooves underfoot. No clamps on underside to hold the mats in place. 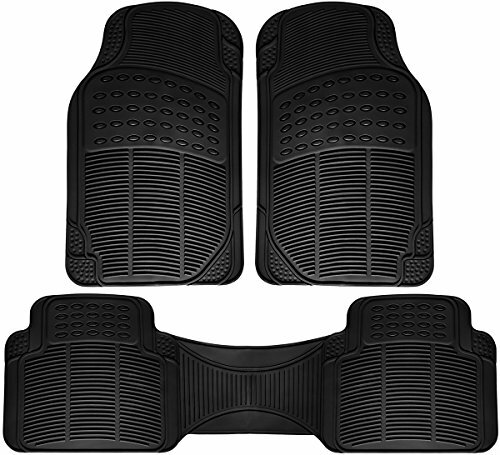 This 3-piece set of car mats from Motor Trend comes in at around mid-range in terms of price, with a choice of 3 unique color options that will suit most car interiors. Like many other mid-range products, the rear seat foot wells share a single runner that extends across the width of the car, hence being 3 pieces as opposed to 4. Measurements: Front 28 x 19 / Rear 17.5 x 56 in. The Flex Tough Rubber used to construct these mats is highly resistant to temperature fluctuations, both hot and cold. Users have a choice of 3 colors, each of which can be trimmed down to fit the cabin of the intended vehicle. These mats feature deep grooves, which are ideal for trapping debris, and water or other fluids, despite some safety issues we’ll touch on in a moment. They also don’t have a strong chemical odor when first removed from their packaging, so there should be no delay in fitting them into your vehicle. What’s more, this rubber is heavy duty and unlikely to wear from accidental tears or rips during fitting or when in operation. These mats lack some of the flexibility seen in other products, as well as featuring a very specific shape that could be harder to fit into some foot wells. They also lose some major points for having two of the biggest flaws that car mats can have. Firstly, they are prone to moving around, owed to a lack of grip on the underside. Secondly, the deep grooves that are intended to be beneficial have been reported as catching on footwear with rugged grips on the soles. Both points raise safety concerns. This 4-piece set of car mats from FH Group comes in a range of color options, which have a direct influence on the price tag attached. That said, all are of a high quality and feature well-designed grooves that help to protect the car's carpeting optimally. Measurements: 18 x 2 x 28 in. 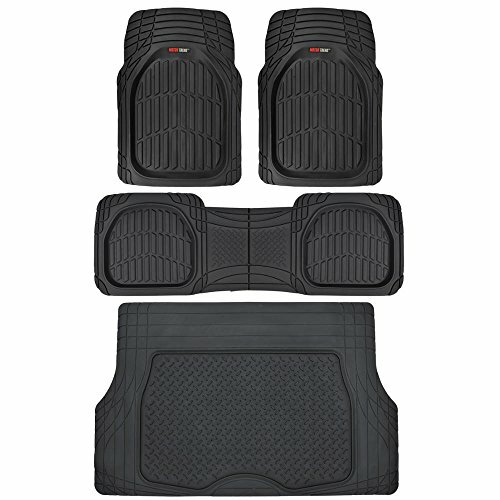 All 4 car mats within this set have waterproof and stain-resistant rubber at the heart of the design, while the mats are not only grooved, but feature tall outer ridges to trap debris and rainwater or other fluids. A heavy nib design on the reverse side of the mats also aids in preventing slippage, by increasing friction between the mat and the vehicle's carpet. Depending on the color option that you go for, these mats are mostly inexpensive and at the lower end of the budget range for a set of 4 car mats. They also have a great deal of flexibility despite their inclusion of heavy nibs and ridging on both sides of the mat. It may also come as a surprise that they’re easy to trim down, despite their bulky and heavy-duty design. 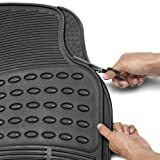 Though the underside of these car mats is designed with anti-slip properties in mind, the nibbed design is still less effective than some of the patented anti-slip measures featured by other designs. In a nutshell, these mats can still have some movement, depending on how well they’re trimmed to fit the footwells. They are also built from thinner rubber, which is likely to wear more quickly than thicker counterparts. 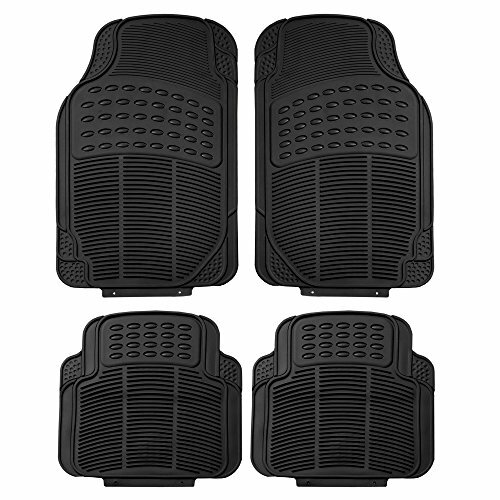 The Custom Accessories Armor All set of 4 black car mats, suited for all-weather use, is priced at the lower end of the budget range. These mats are suited for both light summer use, and for tough wintry conditions, where snow, wet leaves and other forms of dirt and grime are expected. Though the default color is black, these car mats are also offered in both tan and grey colors, allowing you to further customize the interior of your vehicle to match the exterior paintwork. The ‘Carpet Claw’ feature is also a godsend, given that pressure on the surface of car mats can cause them to slip, which gives way to potential accidents or injuries. Finally, the slim-line nature of the mat helps to keep the mats from hardening when the weather turns chilly, keeping them flexible underfoot. Although both front and rear mats are provided in the set, and despite being able to trim them, this does not address the problem that the base mat size is not sufficient for all vehicles; for some, they will simply not be wide enough. Having to trim these mats can also be a little inconvenient but will at least help to adapt them to your specific vehicle. The only other negative point worth noting is the chemical odor that these mats give off after unpacking. It’s important to choose the right kind of car mat for you and your lifestyle or location. For example, selecting a carpet floor mat would not be ideal in conditions that are constantly damp. Nor would it suitable to choose a flat car mat if you regularly wear shoes with little-to-no grip. The below advice will help you to select the right product for you and your lifestyle. Carpeted car mats are more stylish than rubber alternatives, but the rubber ones offer the protection to your car's carpet floor. If you regularly leave your vehicle parked in the sun, then these rubber mats can be good for blocking UV rays that can bleach your car's carpeting. Carpeted floors typically come in many finishes, textures and thicknesses, allowing tailored options to suit the style or level of protection required. However, carpeted floor mats also have one major flaw; they cannot resist heavy soiling from dirt and moisture. In constantly wet or wintry conditions, you could soon find yourself with water damage or mold. Conversely, rubber car mats – often called all-weather car mats – are ideal for conditions that are constantly damp and dirty. They can better resist permanent damage, and are easily rinsed clean of dirt and debris, the latter of which is usually trapped easily by grooves that are present in many designs. The downside here is that many new products, particularly those that are cheaper, will have a strong chemical odor when first unpackaged. It’s worth bearing in mind how much grip you need to prevent your car mats from slipping around while you drive. Some mats will have features designed to improve grip, such as the ‘Carpet Claws’ seen in one of the above products, whereas many rubber designs will have grooves on the underside or topside to aid grip. If you don’t have sufficient grip between the mat and the floor, or between your shoe and the mat, then you could have the mat sliding around. If this happens while driving, you could potentially find yourself in an accident. The primary reason to purchase a rubber car mat over a carpet alternative is usually due to their superior dirt-resistant properties. When you’re routinely in wet and dirty environments, you want a car mat that will not absorb those elements, but one that will also trap them for easy removal from the vehicle. As a result, it helps to have deep ridges within the mat; these will trap and contain any soil, stones or other small debris. If you purchase a lower-quality mat, then it’s common to see less grooves or ridges and a flatter design. Lower-quality mats will also typically have thinner or lighter rubber. This may not initially seem like an issue, but it can often mean that the rubber will become flatter more easily over time, further reducing the mat’s ability to capture debris easily. Thinner rubber can also mean that it is more easily worn and eventually torn from overuse. How do I clean a car mat? Since the above products are all rubber car mats, we’ll focus primarily on those. Rubber car mats can be cleaned with water in most cases; this will be sufficient to remove wet leaves, dirt and wet mud. However, if mud has set and dried, and flexing the mat does not fully remove it, you may use warm water and a non-abrasive, light soap to clean them. Are rubber car mats better than carpet car mats? Rubber car mats are best for conditions that are frequently dirty and damp, as they are more easily cleaned and will not permanently absorb these undesirable contaminants. So, in terms of functionality and maintenance, rubber car mats have more to offer. Is it worth paying more for a car mat? Price doesn’t always directly correlate with quality, though in the products we’ve looked at in this guide you do get an increase in quality when you go for the more expensive items. You’ll also typically see other benefits; for example, cheaper products often use a single runner for the rear cabin, as opposed to individual mats for each of the footwells. Cheaper products may also opt for thinner rubber that is more easily torn or flattened over time. Will any mat fit any car? Not necessarily. Most rubber car mats can be trimmed, though some may be too small to begin with. Any decent product listing for car mats should include the dimensions of every mat, so make sure to measure up your car and check your own measurements against those of the product. 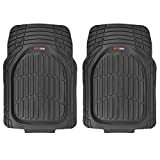 Of the products we’ve looked at above, the clear winner is the first Motor Trend product we’ve listed, the Motor Trend 4pc Black Car Floor Mats Set. Though they’re the most expensive mats out of the bunch, they’re also the most durable and resistant to all types of weather. If you’re in an environment where you’re constantly facing wet and wintry conditions, or if you’re just the type of person who’s constantly in and out of the car, then these are likely to last you the longest and offer the greater protection to your car’s interior carpets.